For many people, their smile is a big part of their confidence. So, what do you do when your teeth become discoloured, chipped or cracked and you no longer feel comfortable with how they look? Here at Peninsula Dental Clinic, we specialise in providing veneers for people who may want to improve the look of their teeth. This is a relatively simple procedure that offers incredible long-term results. Our clinic is located in Rosebud and is perfectly situated to care for people throughout Rye, Dromana, Sorrento, Mount Martha, Blairgowrie, Portsea, Red Hill, Main Ridge, Boneo and the Mornington Peninsula. Get in touch with our team today by calling (03) 5981 2255 to find out whether you are a candidate for veneers or to book an appointment. What are veneers and how can they help you? Dental veneers have the ability to repair, protect, and improve the total appearance of your teeth. A dental veneer is a thin, custom-made covering that is placed over the front of the tooth. This procedure is quite simple and only requires a few visits with your dentist. 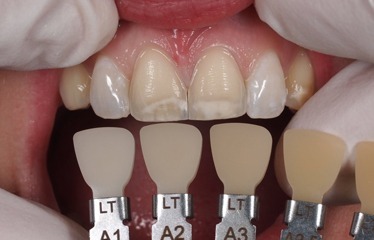 Veneers are generally used for patients who cannot achieve a white smile through whitening and are yellow or grey in colour. They are also used for patients with a chipped or cracked tooth, as they can fix the shape and protect the tooth from more issues. Veneers tend to be chosen by patients’ due to their low maintenance, and because they require minimal change to the existing teeth. Along with veneers, our team is dedicated to providing a wide range of dental services that give you the smile you’re dreaming of. Our solutions include teeth whitening, dental implants, crowns and bridges, wisdom teeth removal, dentures and root canal treatment amongst many others. This dedication to providing top of the range dental care to families throughout the Rosebud, Rye, Dromana and surrounding Mornington Peninsula area is what makes us a trusted name with local families. Looking for a dental clinic to provide top-quality care for your teeth? Contact us today on (03) 5981 2255 or book online peninsuladentalcare.com.au for a consult so that we can assess your needs.